The earliest account describing a plague epidemic is found in I Samuel 5:6 of the Hebrew Bible (Tanakh). In this account, the Philistines of Ashdod were stricken with a plague for the crime of stealing the Ark of the Covenant from the Children of Israel. The word “emerods” and “tumors” is used in most English translations to describe the sores that came upon the Philistines. The account indicates that the Philistine city and its political territory were stricken with a “ravaging of mice” and a plague, bringing death to a large segment of the population. 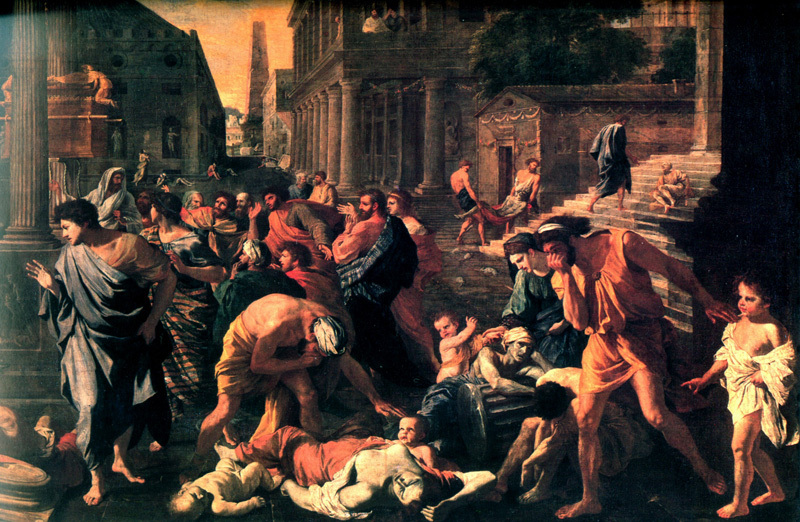 In 1630 the French-born painter Nicolas Poussin (1594 – 1665) began his canvas painting The Plague at Ashdod. By 1630, Poussin was moving towards the uncompromising statements about the moral condition of humanity that were to characterize his work. In the painting in Ashdod, we see mice dashing across the steps of the temple and through the streets and people dying in the most horrific fashion and condition. The Plague at Ashdod is not pointing to the bubonic plague pandemic – because the connection between the disease and the rodents would not be discovered until 1894 – but the painting pointed to a biblical judgment about the moral condition of the ‘plague’ in hearts of the people living in rebellion to a Holy God and the idol-worshipping and ark-of-the-covenant thieving Philistines and the mice that God sent to punish them. The work, like so many religious history paintings of the day, was a fearful reminder for nonbelievers of the vastness of God’s indignation and for believers of the power of God’s judgment of sin. There are two types of afflictions of the heart – spiritual heart disease and medical heart disease (cardiovascular disease). Both have only ONE outcome – DEATH. Israel had been defeated in an initial battle with the Philistines with loss of about 4000 lives (1 Samuel 4:1-2). The elders of Israel concluded that this defeat was because they did not take the Ark of the covenant of the LORD into battle with them. The ark of the LORD was then brought back from Shiloh to Ebenezer where they had camped and accompanying the ark were the two sons of Eli the priest, Hophni and Phinehas, who were also priests of the LORD. Both sons lived in rebellion before the LORD and were wicked men (1 Samuel 2:12; 22-25) and this brought the judgment of death upon them and the house of Eli. The Israelites believing that since the ark of God was now with them and victory was in sight, went into battle with the Philistines. Instead, there was further defeat with loss of 30,000 soldiers killed including both the sons of Eli, Hophni and Phinehas. When Eli learns that his sons are dead and the Ark has been captured, he falls from his seat, breaking his neck and dies. He is followed in death by his daughter-in-law (wife of Phinehas) as she gives birth to the son she names Ichabod which means ‘no glory’ – saying “The glory has departed from Israel, for the ark of God has been captured” (1 Samuel 4:22). And the word of the LORD came to pass that the judgment of death will be upon the house of Eli the priest because they lived in sin and contempt before a Holy God. God cannot be mocked (Galatians 6:7). The Philistines were momentarily jubilant that the ark of the LORD’s covenant was now captured. They brought the ark into the “temple” of Dagon, one of the Philistine gods only to find their god lying prostrate before the God of Israel. They realise that the God of Israel is not an idol made by hands but a living God and the ark of the LORD’s covenant is a symbol of the presence of God the Almighty amongst His people Israel and to be worshipped. The Ark of God may be in the hands of the Philistines but the god of the Philistines is in the hands of the One, true, living God of Israel. This results in divine judgment and an outbreak of plague, sores, tumours ensues among the Ashodites. The Plague of the Heart, Part 2 to follow. Who stands fast? Only the person whose final standard is not his or her reason, his or her principles, his or her conscience, his or her freedom, or his or her virtue, but who is ready to sacrifice all this when one is called to obedient and responsible action in faith and in exclusive allegiance to God—the responsible disciple, who tries to make his or her whole life an answer to the command and call of God is the one who will stand fast. This blog is about spiritual matters of the heart. I welcome your company as we seek out the plague in our own hearts. so we may attain the fullness of the abundant life in Jesus of Nazareth this side of eternity. 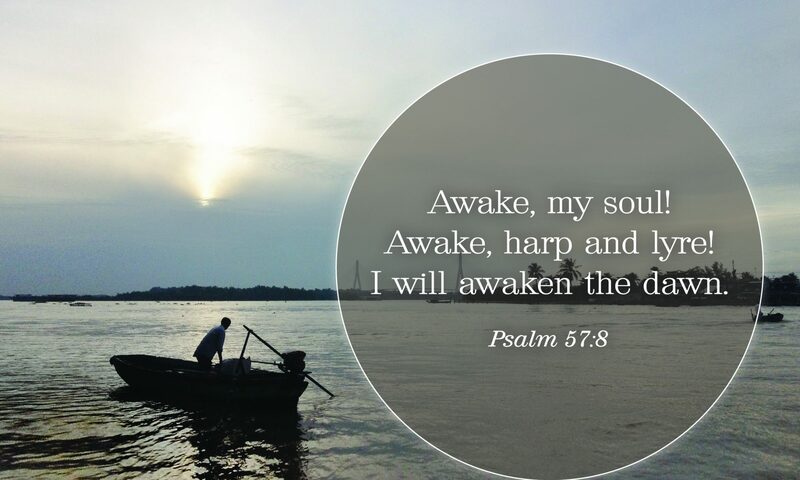 The title 'Awaken The Dawn' is taken from the gratitude journal of king David of Israel: Psalm 57: 7-8: My heart is fixed, O God, my heart is fixed. I will sing and make music. I will AWAKEN THE DAWN. The theme for this blog 'The Plague of His Own Heart' is taken from the prayer of king Solomon of Israel in 1 Kings 8:38, KJV: "...which shall know every man the plague of his own heart, and spread forth his hands toward this house:" The bridge between 'Awaken the Dawn' and 'The Plague of His Own Heart' is the gift of true repentance to God. A Slice from The Heart:- is a Spirit-guided ‘heart project’ that exposes the plague in my own heart. The journey to make it right with God is now recorded till my heart is fixed and I can make music to 'Awaken the Dawn'.